Burglars have stolen a collection of 60 miniature Star Wars figures worth over £10,000 at a Dorset home. 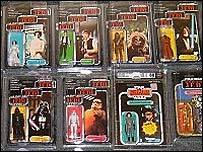 The toys, from the first Star Wars trilogy, were collected over a 20-year period and were still contained in their original packaging. Thieves stole the action figures last month when they ransacked a house in Lower Parkstone, Poole. Det Con Scott Brimicombe, of Poole CID, believed the collection was stolen to order. "I suspect the thieves knew what they were going to steal as the collection of 60 boxed Star Wars figures are very collectable and valuable," he said. Other items stolen included a Gibson "Les Paul" guitar , computers and other electrical items. Police are appealing for witnesses or anyone with information about the burglary to contact them in confidence.